You are always welcome to visit and worship with us at Olmstead Baptist Church. The address is 2075 Olmstead Road, Olmstead, Kentucky. 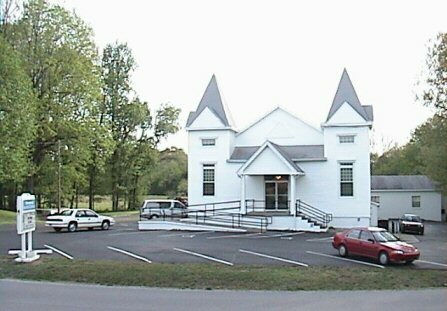 The church is situated on Whippoorwill Creek, less than two miles east of the Olmstead community in beautiful southwest Logan County, Kentucky. Take Highway 68 West to Russellville, KY. Turn right onto U.S. Highway 79 headed southwest toward Clarksville, TN. Turn left on state road KY 775 (headed east) toward Olmstead. Proceed through Olmstead, across the railroad tracks, past the U.S. Post Office on the right, and the Olmstead Elementary School on the left. The church is located just across the bridge over Whippoorwill Creek. Take Highway 68 East from Hopkinsville toward Elkton, KY. After passing through Elkton, begin looking for the road sign to Daysville, KY. Turn left off of Highway 68 East at Daysville onto state road KY 1309 headed southeast. Continue on 1309 until you reach U.S. Highway 79. Turn right (southwest) onto U.S. Highway 79 toward Clarksville, TN. Turn left on state road KY 775 (headed east) toward Olmstead. Proceed through Olmstead, across the railroad tracks, past the U.S. Post Office on the right, and the Olmstead Elementary School on the left. The church is located just across the bridge over Whippoorwill Creek. Take U.S. Highway 79 (northeast) over the Kentucky state line. Proceed northeast on U.S. 79 until you see the green sign for Olmstead Elementary School. Turn right on state road KY 775 (headed east) toward Olmstead. Proceed through Olmstead, across the railroad tracks, past the U.S. Post Office on the right, and the Olmstead Elementary School on the left. The church is located just across the bridge over Whippoorwill Creek. Take I-24 West toward Clarksville, TN. Exit onto U.S. Highway 431 North and head to Springfield, TN. Follow U.S. 431 through Springfield. After leaving Springfield, turn left onto Tennessee Highway 161 through Barren Plains, TN and across the Kentucky state line. At the line, the road changes to state road KY 102. Take this road into and through Keysburg, KY and then through Allensville, KY until you reach U.S. Highway 79. Turn right onto U.S. 79 headed northeast. Proceed northeast on U.S. 79 until you see the green sign for Olmstead Elementary School. Turn right on state road KY 775 (headed east) toward Olmstead. Proceed through Olmstead, across the railroad tracks, past the U.S. Post Office on the right, and the Olmstead Elementary School on the left. The church is located just across the bridge over Whippoorwill Creek.